I travel between Abuja and Lagos frequently, sometimes as much as once a week. Before, I relied on Virgin Nigeria, but since their wobbles (literal and metaphorical), I have switched to you. I like flying Aero Contractors - the service on the plane is excellent. Your flight staff are pleasant and well trained. I like the fact that you serve cashew nuts as a snack - which I can eat - as well as cake - which I cannot. I really like the fact that you have been going for 50 years - it shows that a Nigerian company can thrive for decades if well managed. I also admire the way you have led the pack on e-commerce, driving online use of e-payments more than any other Nigerian company by offering huge discounts and pushing the price of a ticket to as low as N8000 per flight. Its all very good and highly commendable. My one gripe is the queue at Abuja domestic terminal (see camera-snap above). You are not blessed with a good spot, it is true. That dark corner makes creating an orderly queuing system a challenge. The use of the rope-divider (dividing those who have a ticket from those who want to buy one) has helped. But the worst of it is that your poor check-in staff have to write out all boarding passes by hand. This always creates a stressful bottleneck, and makes travel from Abuja to Lagos on a Friday by Aero something only those who thrive on wahala should opt for. And they have been operating for 50 years??? 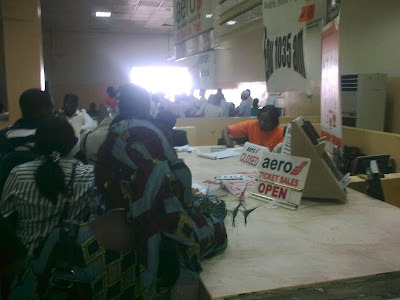 I too have made the switch from Virgin Nigeria to Aero, in spite of recently registering as an Eagle Flyer. Also, as much as I enjoy the Aero service, the ABJ to LOS check-in is a real irritant. There's the funny thing you have to do with luggage i.e. pass back and forth through the detector (thankfully my brother always spares me this agony). And yes, the rowdiness at the counter made me blow my top last week. One man was trying to reach over and around me, and just as I told him where to go, another came so close, he left me with no option but to ask if he was trying to 'know' me in the biblical sense. At the time though my language was not so euphemistic. five days elapsing between posts - unacceptable. no bueno for the soul, sir. love your blog, btw. Hi There. I avoid all this by checking in online. I just go straight to board. I also pick a choice seat (4A).